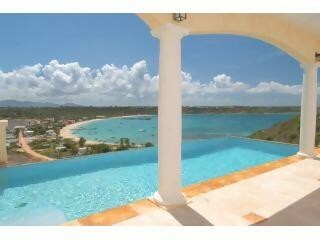 Spyglass Hill Villa, Anguilla is a gorgeous vacation rental located at North Hill just 5 minutes away from Sandy Ground. 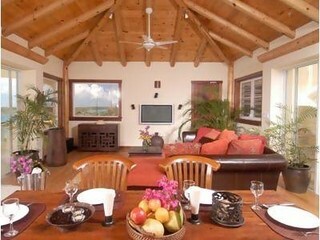 The villa has the warmth of the Caribbean captured by the designs with wood and bamboo features. If you are staying in the master suites you are fortunate to awaken to ocean views, with private patio views, indoor and outdoor showers and jacuzzi. Remain cool with air conditioned guest and master bedrooms complete with ceiling fans. 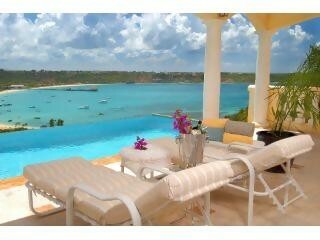 This beautiful Anguillan villa would not be complete without a fully equipped kitchen, cozy living and dining areas, powder room, laundry and garage. When you are tired of swimming laps at the beach there is an indoor fitness room with an elliptical machine and treadmill with ocean views for your pleasure while working out. The infinity pool adds to the eclectic style of the villa, you can relax while overlooking Road Bay harbor, enjoy impressive views of the Caribbean Sea, neighboring islands, tropical sunsets and the charming village of Sandy Ground below.